My current project started out as an attempt to make a "block sized" set with my friends. I wanted to make a proper project out of it, taking notes and everything. 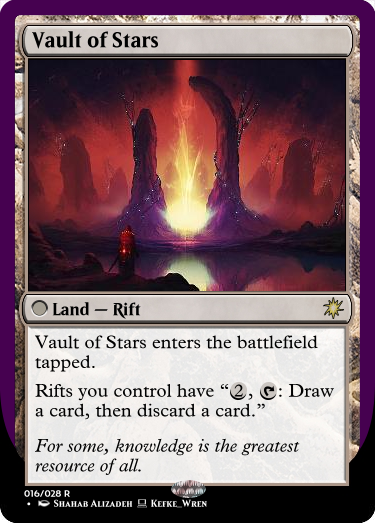 However, after months of me making proof of concept cards and brainstorming ideas, my friends barely talk about the subject when I bring it up, and have thus far contributed exactly one idea - a mechanic I'm not even sure is workable, because when I asked on here about how to get a rules-legal wording, all people wanted to talk about was alternative ways to achieve the same result, and wouldn't answer my question at all. However, I've put a lot of time into this already, and don't just want to drop it. 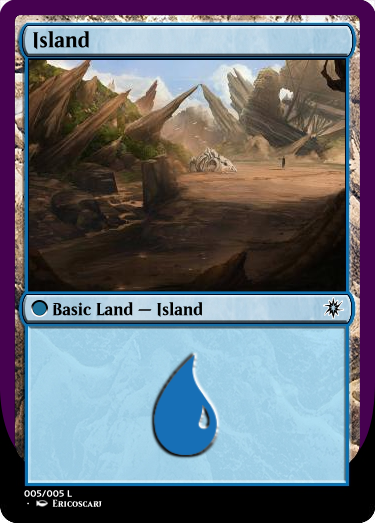 It takes place on a plane called Ceanndar, an old world whose mana has been depleted. 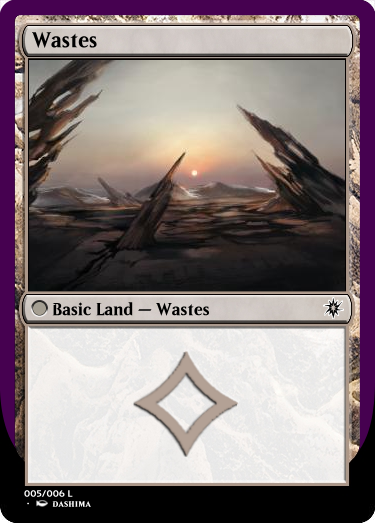 Where once there were great works of magic and artifice, now almost everything is scarce, and most of the population lives within the scattered remains of the great cities of old. The world is in decline and an air of desperation pervades. Most try to make do with what they can find, seeking new and creative ways to make use of what little they have. Most of the land is laid to waste, though some cities still maintain artificial environments. The five largest remaining cities have become city-states in their own right, making vassals of the smaller settlements near them. 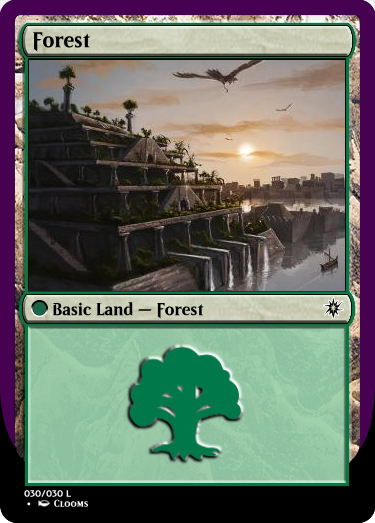 Each of the city-states specializes in a different colour of magic, in accordance to the artificial biomes within their walls. They can still get the support of other colours through temporary alliances, or through the aid of their vassal cities, but wars over resources are common. 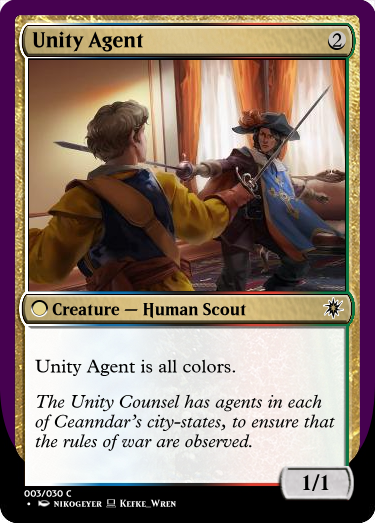 Only the threat of annihilation should one of them overextend their limited resources, and the intervention of a surprisingly organized mafia-like syndicate calling themselves the Unity Counsel, keeps the Five Cities in check. Proud and noble Valanor, still clinging to their lost glory, specializes in White magic. 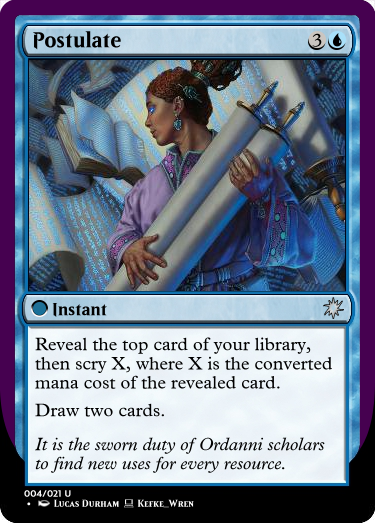 Creative and scientific Ordan, once a great university town, specializes in Blue. Secretive and resourceful Chendar, fallen to plague and repopulated by the unwanted, specializes in Black. 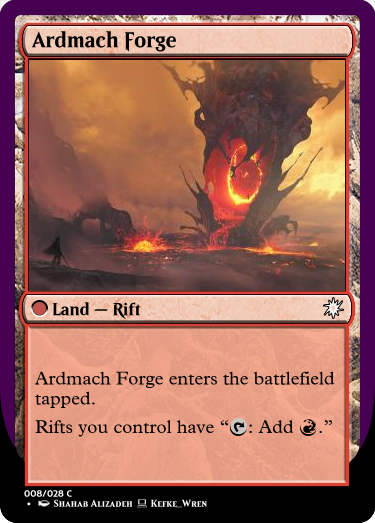 Industrious and ambitious Ardmach, ruthlessly efficient, specializes in Red. 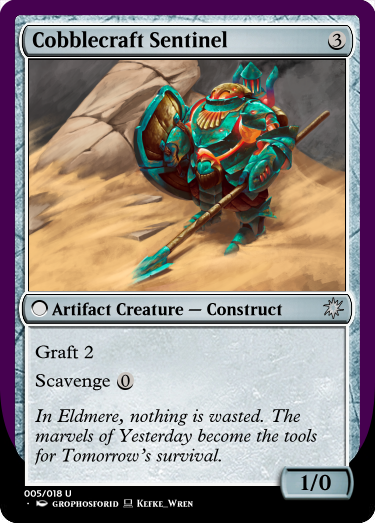 Adaptable and pragmatic Eldmere, forever continuing to grow, specializes in Green. As the inhabitants of Ceanndar seek new and better ways to survive, research into new forms of magic has taken place. The Five Cities, whether through spying, theft, or independent research, each begin to tear holes in reality, to tap the power of distant planes. 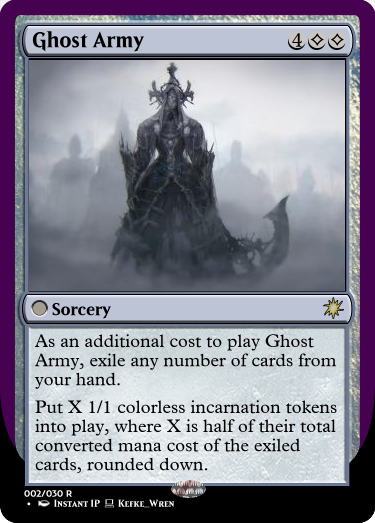 Elsewhere, mages seeking their own path share the secrets of nihilmancy, tapping into the Void itself, and giving the set a "colorless matters" theme. Still others practice strange experiments of artifice and spellcasting. Only time can tell what impact these experiments and breaches in reality will have on the already strained world of Ceanndar. ...and that's basically what I've got. 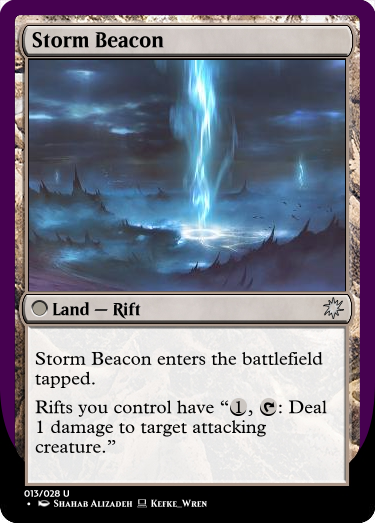 There's a few half-baked ideas, like a new card type called "Superstitions" that make creatures stronger when you meet certain requirements and/or weaker when you violate restrictions, or a category of Planeswalker Artifact hybrids that simulate the players gearing themselves to directly take part in the battle, but those are more just ideas of things I could play with than things designed specifically for Ceanndar. 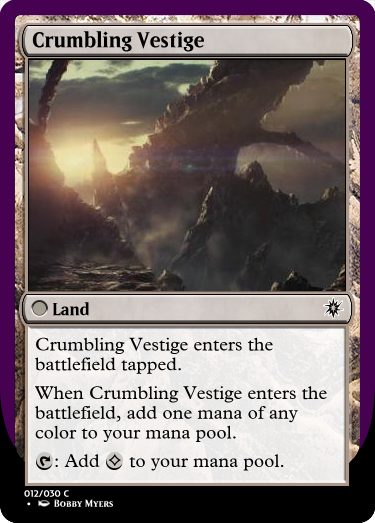 What I'm looking for is some people I can team up with - Decide if this is the right direction to go in or abandon it early, look at what new mechanics to use and what old ones to bring back, help me come up with and balance cards. Or more plainly, some friends/partners who won't just say "Oh, that's cool..." to anything I show them, and completely forget that I asked them to help the rest of the time. Also possibly someone to take the lead, as I question my leadership skills, and really see myself as more of an advisor? If you really want to go with this I would be able to help, even though I don't have much time to spare. Also, I think you should lead the design, because its your set after all and I'm sure no one can keep the "spirit" of the set as you, the creator, can. I'd be happy for any help I can get. I see your point about the spirit. I just don't feel like I'm a good leader. It's a problem of mine, I admit - I just lack confidence, I guess.